ASUS today announced Designo Curve MX34VQ, a 34-inch Ultra-Wide QHD (3440 x 1440) curved monitor with a 21:9 aspect ratio for panoramic viewing. It features an ultra-high contrast ratio for truly lifelike visuals with brighter whites, deeper blacks and amazingly vivid colors. The 1800R curvature panel delivers a wider field of view, resulting in a more immersive and comfortable viewing experience. MX34VQ features ASUS SonicMaster audio technology, co-developed by Harman Kardon, for home-theater-quality audio. In addition, it has a Qi wireless charger built into its base. Designo Curve MX34VQ has won several awards, including the 2016 Good Design and 2017 CES Innovation awards. 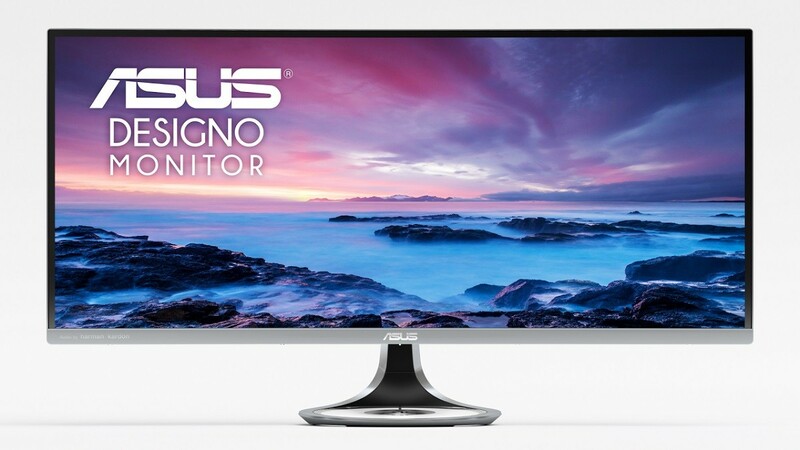 ASUS Designo Curve MX34VQ is a 34-inch display with an Ultra-Wide QHD (3440 x 1440) panel that provides viewers with highly-detailed visuals. Ultra-Wide QHD has a 2.5 times (2.5X) higher resolution than Full HD, resulting in more detailed visuals and 35% more onscreen space for efficient multi-tasking. The optimal curvature of the 1800R screen creates a wider field of view, making the screen seem larger and more immersive than a flat screen of the same size. The panel curvature of the display ensures every point is equidistant to the user’s eyes to ensure a comfortable viewing experience. Designo Curve MX34VQ features 178-degree wide-view technology across its both horizontal and vertical planes so there’s no color shift when viewed from extreme positions. It also features an ultra-high 3000:1 contrast ratio to deliver the brightest white and deepest black hues. Designo Curve MX34VQ features a transparent base with a built-in Qi wireless charging pad. This charges Qi-compatible devices automatically the moment they are placed onto the charging pad. The base has built-in LEDs and emits an aurora-like glow during charging. Designo Curve MX34VQ features dual 8-watt speakers that deliver premium home-theater-quality audio thanks to ASUS SonicMaster audio technology, co-developed by Harman Kardon, a leader in infotainment and professional audio. Designo Curve MX34VQ has undergone stringent performance tests and is certified by TUV Rheinland laboratories, a global provider of technical, safety, and certification services, to be flicker-free and to emit low levels of blue light. ASUS Eye Care features the ASUS Blue Light Filter and ASUS Flicker-Free technologies. The ASUS Blue Light Filter protects viewers from harmful blue light; it has four different filter settings that can be easily accessed in the onscreen display (OSD) menu. ASUS Flicker-Free technology also helps reduce onscreen flicker for a more comfortable viewing experience. 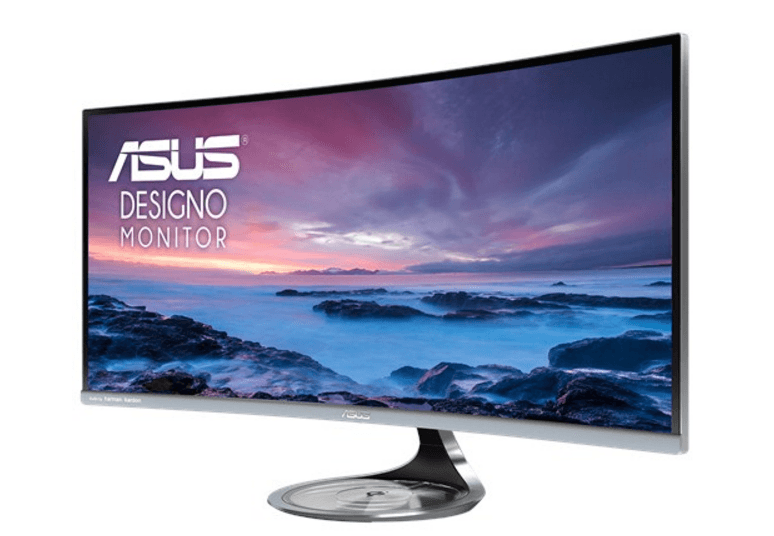 ASUS Designo Curve MX34VQ will be available from late February in Australia. Estimated launching RRP will be AUD$1499.00.